In an interview Tuesday night, Democratic National Committee Chair Debbie Wasserman-Schultz refused to address questions about the wisdom of her Democratic colleagues inviting two officials from the Council on American-Islamic Relations (CAIR) to the State of the Union address. As we reported Monday, Democrats Alcee Hastings of Florida and California's Zoe Lofgren invited CAIR officials to the speech in response to a call from Wasserman-Schultz and Rep. Keith Ellison. It was a symbolic response to what they see as overheated rhetoric toward Muslim Americans in the ongoing presidential campaigns. 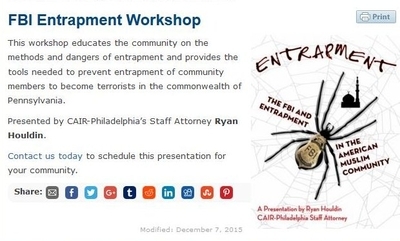 By embracing CAIR, the representatives did something the FBI proscribes for its agents. Internal documents seized by the FBI show CAIR was founded as part of a U.S.-based Hamas support network. CAIR founder Omar Ahmad was a leader of that network, called the Palestine Committee. Nihad Awad, the only executive director in CAIR's 21-year-history, also was part of the group and participated in a secret meeting of Hamas supporters in 1993 aimed at derailing the U.S.-led Oslo Accords which sought to bring peace to the Israeli-Palestinian conflict. The Palestine Committee opposed the effort because it included recognition of Israel's right to exist, and because it empowered the secular Palestine Liberation Organization over the Islamist Hamas terrorist group. 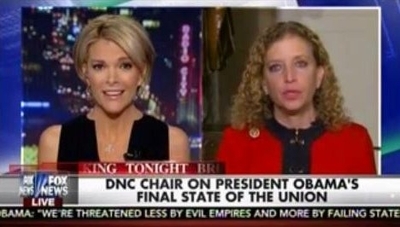 On Fox News after the speech Tuesday night, host Megyn Kelly asked Wasserman-Schultz whether the invitation to the CAIR officials was a mistake, noting "President Obama's DOJ says they're directly linked to Hamas, which we recognize is a terrorist group." "Megyn, now who's talking about something that's disappointing?" Wasserman-Schultz asked. She never addressed the question about CAIR's sordid history. For merely engaging in journalism by asking the question, Media Matters for America writes that Kelly "attacks" the DNC chair. Here's what an FBI assistant director wrote in 2009, explaining why the agency broke off "all formal outreach activities with CAIR": "[U]ntil we can resolve whether there continues to be a connection between CAIR or its executives and HAMAS, the FBI does not view CAIR as an appropriate liaison partner." The policy remains in effect seven years later. Wasserman-Schultz either doesn't believe the FBI or doesn't care what evidence it has to support its policy. That's disturbing for someone in a leadership position. But she also does a broader disservice by casting CAIR as the voice of Muslim Americans when, in reality, most want nothing to do with the Islamist group. A 2011 poll from the by Abu Dhabi Gallup Center in the United Arab Emirates found 11 percent of women and 12 percent of men believed CAIR represented their interests. On top of CAIR's documented ties to Hamas and a terror-financing network, the group reflexively opposes terror support and financing prosecutions, accuses federal law enforcement of entrapping otherwise innocent and peaceful Muslims in order to gin up terrorism prosecutions and of using excessive force with Muslim suspects. As we noted Monday, inviting Muslim Americans to the speech is not the problem. But if the objective was to show there's a monolithic community of liberty-minded Muslims with no skeletons, including CAIR representatives is ignorant and counter-productive. The same is true for New Jersey U.S. Sen. Cory Booker, who invited the treasurer of a group which wants the Muslim Brotherhood back in power in Egypt. Last month, the White House hosted a CAIR official who is helping a family sue the FBI, alleging an agent unjustly shot and killed a friend of Boston Marathon bomber Tamerlan Tsarnaev after hours of questioning in his Orlando home in 2013. Meanwhile, reform-minded Muslims who unequivocally reject "interpretations of Islam that call for any violence, social injustice and politicized Islam" and advocate "equal rights and dignity for all people, including minorities," and women were shut out of the Democrats' invite-a-Muslim program. Maybe a House Democrat should stand up and challenge colleagues to empower those free-thinking Muslims by giving them a seat at the table, too. Democratic National Committee Chair Debbie Wasserman-Schultz strikes me as a real Democratic Party apparatchik who either does not understand what is going on or is reading the sound-bites provided to her by her Leftist overlords. She would do anything to curry favor with the leftists who now rule over the party. The Dems long-term objectives are to extend the Obama doctrine well into the future with more control over the message and more control over the media. Islamism and immigration play a major role in the Dems attempt to extend their dynasty. Immigrants and illegals tend to vote for those who let them through the door (illegally) and the government which offers them free stuff and assurances that they will never be deported. The Dems are experts at pandering to this demographic. The Islamization process and the process of shutting down and shutting up anyone who dare expresses any concern over a political religion that has as its end goal to conquer and destroy "our house" is well under way (with help from the UN, the EU and several billionaires like George Soros who somehow make money off the carcass of Western society as he did to build his initial fortune in Germany/Europe off the corpses). Debbie Wasserman Schultz is a perfect example of inept people working in Washington that represent a security risk to this country. She should be working at the department of motor vehicle checking people's wiper blades and head lights. The one constant that every democrat adheres to is never, ever take a critical, perceptive, common sense view of any initiative, regulation or policy proposal offered up by any democrat, no matter how inane, incoherent or egregious. That all spout essentially the same so called "talking points" suggests they have a large staff of writers, propagandists if you like, creating the appropriate, established party line. Adherence to this line produces the much desired party unity required to deflect, deviate, obfuscate or ignore any line of inquiry that could potentially crack the desired facade. It is a well oiled, smooth running machine that the most obvious, widely reported evidence suggesting anything contrary to the official positions is so effectively suppressed that the generally complacent, unquestioning viewer, reader or listener is essentially indoctrinated, rendered ignorant, and imbued with a sense of outrage against the "extreme, right wing, Islamophobic, Christian, gun toting fanatics" who dare to be critical. The Democratic party has proven once again just how out-of-touch it is on critical national security issues. CAIR has provided financial, legal, and lobbying support to dangerous terrorists who want to destroy America. The Democratic party refuses to admit what should be self-evident: Those who provide assistance to dangerous Islamic terrorists represent just as much a menace to national security as those who plan or carry out the mass murders. The Democrats are making it extremely easy to vote against them in future elections. If we can't protect our security against dangerous enemies nothing else matters.